When it comes to book-related crafts and activities, we love to keep them simple! 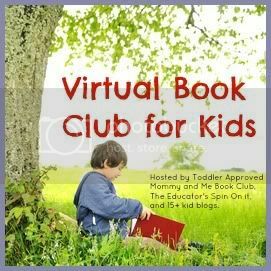 This month we are spotlighting books by David McPhail for our Virtual Book Club for Kids. We checked several David McPhail books out of the library since he is a new-to-us author and we've been reading them all month. 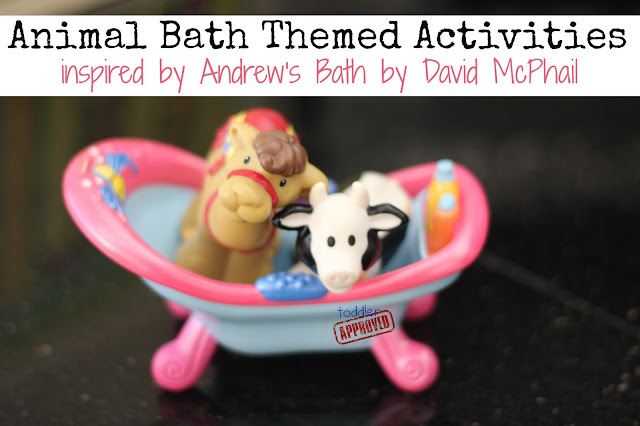 My son's name is Andrew and both of my kids LOVE to take baths, so we knew we had to feature Andrew's Bath as our book for this month. It was a hit! Andrew's Bath is a book about a boy named Andrew who is very picky about how he takes baths. One day his parents decide to let him take a bath by himself and a whole bunch of animals join in on the fun! The book is silly and my kids loved checking out the illustrations and seeing the goofy things that each animal did while Andrew was trying to take his bath. 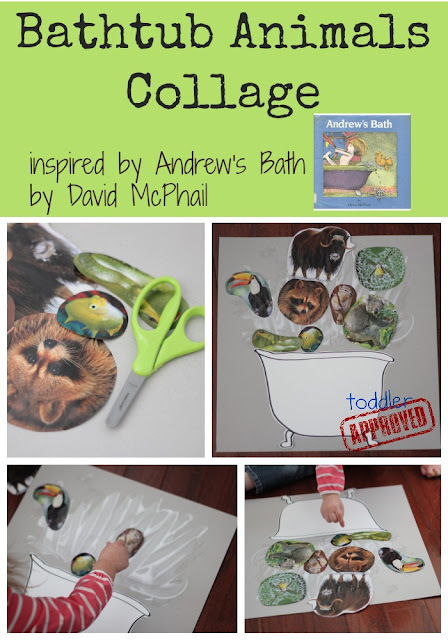 In the book, lots of animals joined Andrew in the bathtub... so we decided to create a bathtub filled with our favorite animals. The first thing we did for our collage was scan through our Ranger Rick Jr magazine and check out the animals. We talked about our favorites and how they would act in the bathtub. Next we cut out our favorite pictures. I cut a few and my four year old cut a few. Then we drew a big bathtub and glued the bathtub and animals onto a big piece of tagboard. We talked about the characteristics of each animal and the silly things they would do in the bath. My son's favorite idea was that the chipmunk would eat all of the soap in the tub! Once the picture was dry we pointed to our favorite animals and told our own version of Andrew's Bath, spotlighting the animals we chose! It was a lot of fun for both my toddler and my four year old! We love to do simple toy bath time by grabbing tupperware containers, water, dixie cups, and little mini paintbrushes. The first thing we had to do was hunt for toy animals. I thought this would be simple... but I was totally wrong! This became a great activity to talk to my toddler about the differences between animals and people. Once we had two tupperware containers filled with animal toys (one for each kid), I dumped some water in them and let the kids have a good time cleaning the animals with paint brushes and pretend soap and shampoo. This activity went on for awhile and my kids got soaked... which was why we had towels underneath everything! This activity could easily be done in the bath but my kids seem to think it is more fun outside of the bathtub. I also love to do bath time activities outside (when it isn't cold). There are so many fun bath-themed activities to try out. 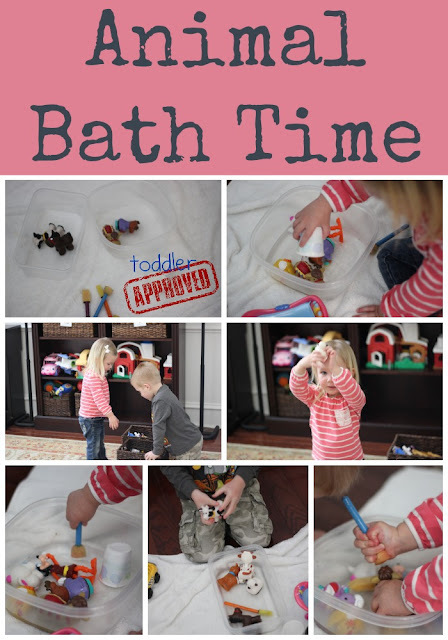 Have you checked out Bath Activities for Kids? They share loads of creative ways to have fun in the bath with your kiddos. Now that we've shared our activities with you, we're excited to see what you came up with! Please add your links to any David McPhail inspired posts to the blog hop linky below. Link up only posts inspired by David McPhail that share children's book inspired crafts, activities, recipes, etc. Any other posts will be deleted. My son would love the animal bath. We will have to try that one. Thanks for the idea! Great activities. My son love baths and would choose to take all of his animals into the tub. I love the collage! You did some great activities for this one! It's so fun to find a book that has your child's name as the main character! I love these ideas. I move our sand and water table indoors to the storage area in our basement in the winter because there is a drain in the floor in there. This is an activity we are definitely going to add to our water table time!